Stepper motors have a wide range of applications in a number of industries. They are some of the most important pieces of equipment in robotics, industrial manufacturing, packaging, medical device manufacturing, optics, industrial motion designs, slot machines, image scanning, intelligent lighting, computer printing, and 3D printing. They are used in many industries and fields, wherever there’s a need for high-precision cutting of metalwork or woodwork, together with the need for perfect positioning and motion control. But a stepper motor wouldn’t be able to help with great positioning, motion control, and high precision without an integral piece of equipment – an XY stepper motor table. Before we get into what this XY table is and what benefits it provides, let’s have a closer look at what stepper motors actually are and how they operate. A stepper motor is a brushless DC electric motor that consists of a motor, drive, and an open-loop or closed-loop controller. It is a motion-control positioning system that helps divide a rotation into a number of equally sized, fixed steps. You can control its speed according to your needs by controlling the time between the steps, that is, by controlling the electric current. A stepper motor has a central piece shaped somewhat like a gear. It’s called a rotor, it is made of a stack of steel laminations. The rotor has a number of rotor teeth that align with the stator teeth when they are energized through the coil on the stator teeth. This means that a stepper motor works on the principle of unlike poles attracting each other. The rotor rotates on that principle, that is, moves towards the energized coil, when a pulse of electricity is provided, to align its teeth with the stator teeth. This is how a typical open-loop stepper motor operates. How Does an XY Stepper Motor Table Work? 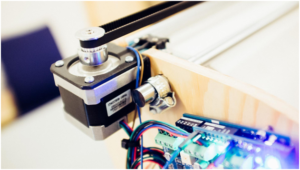 As you already know, your stepper motor cannot help you do any of your precision cutting unless you use it with another necessary piece of equipment. 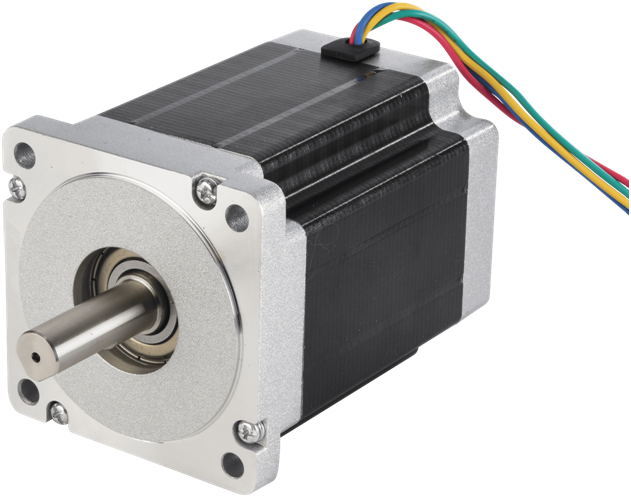 Stepper motors are frequently used in conjunction with various other precision-positioning equipment, such as rotary stages, linear stages, linear actuators, and much more. But here we’re interested in an XY stepper motor table. What exactly is this type of XY table? This XY table enables an XY motion control. This means that it enables a stepper motor to move along two axes – a vertical X-axis, and a horizontal Y axis. By using this XY table, you control the motion of your stepper motor and are able to cut metal or wood with incredibly high precision. When mounted on an XY table, and calibrated properly to meet your needs, a stepper motor helps you achieve a perfect level of accuracy. It’s very simple to use, provides high reliability, and an excellent response to starting, stopping and reversing. The motor has high torque at startup and low speeds, it is very easy to maintain, and it is very cost-effective, given the control, accuracy, and reliability you get. How to Calibrate Your XY Stepper Motor Table? To calibrate your XY stepper motor table, you will need three components: a stepper motor, controller, and drive. You will also need a PLC (programmable logic controller), or a PC, to configure the system and calibrate the motor. A PLC or PC will also help you with supervisory control. Let’s take PLC, for instance. You need to program your PLC so that it can send proper commands to the controller of your stepper motor, and help you with your high-precision cutting. Don’t worry if you’re not tech-savvy. There are plenty of prebuilt PLCs you can get your hands on. When coupled with a stepper-motor controller, they require you to only set a few necessary parameters, instead of having to program everything on your own. The crucial parameters to set include the direction your motor will rotate on the X and Y axes, and the starting position of the motor on the X-axis. You then need to start the motor, stop it after a desired advanced amount, and calculate the distance according to the number of counts per unit distance. Once you enter that value, you need to repeat the process for the Y-axis. All of this will help you calibrate the motor properly for literally any kind of high-precision cutting you need to engage in. Hopefully, you now have a clearer picture of how stepper motors operate, and how XY tables help them reach their full potential. The whole process turns out to be quite interesting now, doesn’t it? It’s quite easy to use these pieces of equipment, and it’s also very easy to configure and calibrate them. You’ll definitely understand it all better through hands-on experience, so get your stepper motor right now, mount it on your XY table, work your way around a PLC, and get the most out of this remarkable motion-control positioning system. PREVIOUS POST Previous post: Why is hacking so common these days?